Since single ply roofing membranes first appeared in the roofing industry, almost 40 years ago, several types of installation techniques have been used, such as mechanical attachment, ballasted methods and adhered systems. At first, adhered systems were thought to be too costly and hard to install. But this is not the case today as they’re easy to install and cost effective. 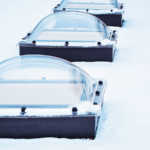 In fact, they continue to be commonly used on roofs. Here are some of the positive features of single ply adhesives and asphalt emulsion products and why it’s important to have a professional apply these products. Single ply adhesive products are used for adhering roofs in exceptionally windy climates that require higher wind uplifts so that a roof lasts longer. Because they don’t use fasteners, you don’t have to worry about penetration damage through a roof deck. But this is just one of their many positive features. Another huge benefit is that they’re easy to apply as they offer a smooth application. Additionally, they dry quickly, taking only a few minutes. These products are exceptionally weather resistant. Furthermore, you can use them for most types of insulation. Consider that they don’t involve tooling costs, which can save you money. It’s important to select the right type of adhesive for a single ply roof so that your roof has optimal performance. There are two types of adhesives that are used for single-ply roofs: foam adhesives and liquid adhesives. Foam adhesives, which come in spray or liquid form, are generally intended for adhering cover boards to a deck or adhering insulation. Liquid adhesives can be used for adhering to cover boards and insulation. What’s more, they can also be directly adhered to metal, wood, concrete and other substrates. Asphalt emulsion products use water, rather than solvents, as a carrier. In other words, it’s liquid asphalt cement that consists of asphalt and water, along with an emulsifying agent. This softening or emulsifying element, which is also known as a surfactant, is made up of large molecules that resemble tadpoles. The purpose of the emulsifier is to control the breaking time by keeping the asphalt droplets suspended. This leads to a milky-like, creamy liquid product that can be used for roofing repair materials. 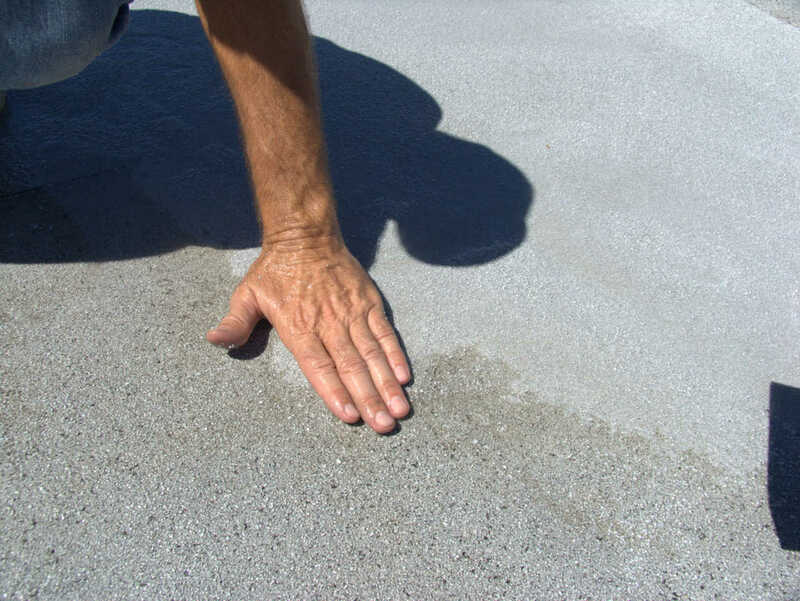 It can also be found in driveway sealers, caulks, preservation projects and other products. One of their main benefits is that asphalt emulsion products are energy-efficient as you can use them without needing additional heat. As a result, you can save money on energy costs. Also, they’re extremely environmentally friendly with hardly any hydrocarbon emissions, and they’re affordable. Single ply adhesives should not be applied when temperatures are below 41 degrees F (5 degrees C). 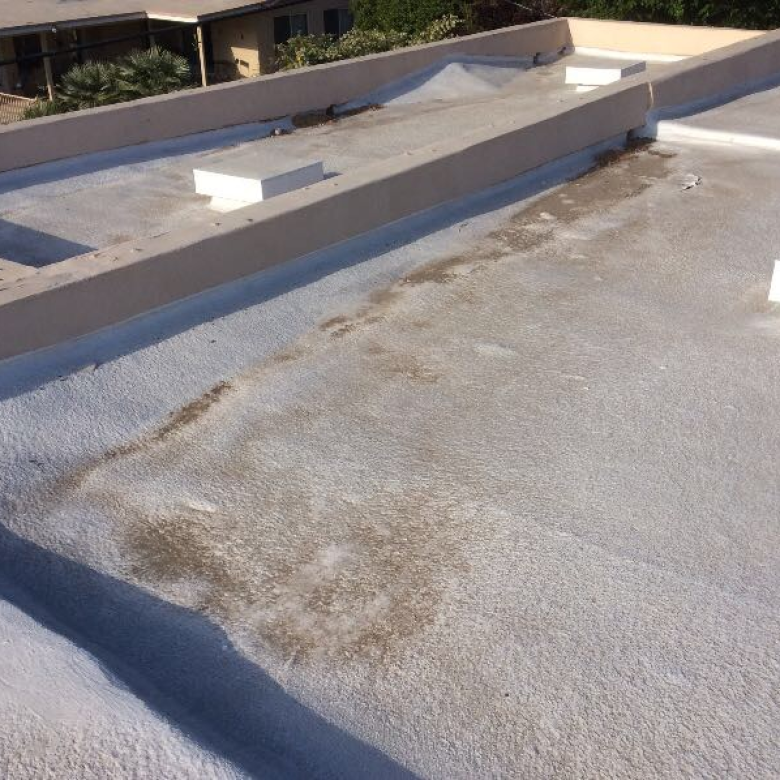 Do you have a flat commercial roof? 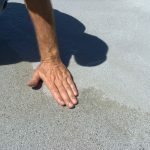 If so, it’s at risk for a common problem known as ponding water, which is water that remains on a flat roof for 48 hours or longer following rainfall. 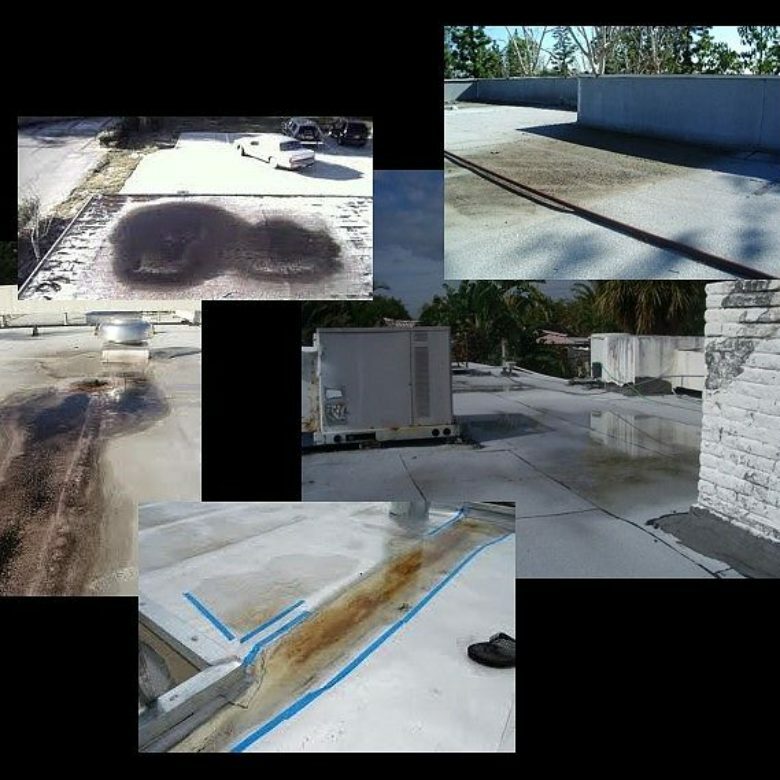 At RoofSlope we have a highly effective product formulated to fill in low spots on flat roofs so that ponding water is not an issue. Please contact us and learn more about how we can help you avoid ponding water.